In 1922, Benito Mussolini (Il Duce) came to power as the prime minister of Italy and the leader of the National Fascist Party. At first, he ruled democratically and constitutionally, but in 1925, he turned Italy into a one-party, totalitarian state, and ruled as Italy's dictator. He forcefully governed Italy until 1943 when the Allied invasion of the country led to his downfall and execution. His rise to power was remarkable. He went from being a journalist and a minor political figure to becoming prime minister of Italy within the space of five years. The fear of a communist revolution abetted his remarkable rise and allowed Mussolini and his fascist party to seize power, with little opposition. Prior to 1914, Mussolini was a committed socialist. However, when the socialists adopted a policy of neutrality in World War One, Mussolini opposed it and was later expelled from the party. Mussolini was a well-known journalist and had strongly advocated for Italy’s entrance into the war in his newspaper, in 1914. Mussolini was an Italian Nationalist, and he wanted to unify his country, he regularly employed nationalist rhetoric that portrayed Italy as a great power to eliminate regional loyalties that had kept the country divided despite the official unification of the country in 1871. When Italy did enter the war on the side of the Allies in 1915, Mussolini volunteered and served with distinction on the front. He was severely injured in 1917 and was forced to leave the army. Mussolini, like Hitler, Mussolini was deeply influenced by the war, and he came to believe that war was essential for a nation, as it would allow it and its people to achieve greatness. Later on, as leader of Italy, he would seize every opportunity to become involved in war and conflict. The war also confirmed Mussolini in his belief that action mattered more than debate and reason, and this was central to his fascist ideology, in turn, this led to the glorification of violence. After the war, Mussolini found the Italian Fascist Party. The ideology of the party was a fusion of socialism and nationalism. The Party called for a strong nation led by an elite to guide Italy and to solve its interminable social and economic problems. Mussolini’s new party was attractive to many and especially ex-soldiers. The party soon had genuine mass appeal, and much of this was based on Mussolini's calls that all Italians unite and overcome their class differences. As the war ended many war veterans joined the new Fascist Party and believed that it offered the best hope for Italy. Many of these men were unemployed after the war, and they felt that their sacrifices during the war had been in vain. Mussolini cleverly formed squadrons of these veterans and employed them against all those he declared to be the enemies of Italy. These squads of former soldiers became known as ‘Blackshirts,’ and they proved to be a formidable paramilitary force. The Italians had entered into the First World War on the side of the Allies, and they had been promised new territories and colonies. Many Italians had supported the country’s entry into the war in the belief that Italy would finally be elevated to a major European power by acquiring colonies. After the Treaty of Versailles, the Italians, though technically on the winning side, were not accorded equal status as the other major allied states such as France and the United Kingdom. Furthermore, the country did not receive the territories or the new colonies that many Italians, they had been promised and it soon appears that the country's sacrifices during the war, were all in vain and pointless. The Italian middle class, which was very nationalistic were especially disappointed, and many grow disenchanted with the country's democratic model of government and came to believe that it could never truly unite the nation and establish it as a world power, like France or Britain. Like many Germans, Italians believed that the old political elite had betrayed the nation. The general population, primarily the Italian middle-class, became increasingly disenchanted with the nation’s political class and system. Mussolini never lost an opportunity to denounce the political class, and this increased his popularity. The end of the war also led to a significant economic crisis in Italy. Unemployment was widespread, as was hunger, especially among the urban poor and in the South of Italy. This made the Italian political class and even the King, Victor Emanuelle III, extremely unpopular. By 1920, the old political parties were deeply unpopular, and there was a widespread sense in Italian society that change or some revolution was needed to save the country. The postwar economic and political circumstances in Italy created a great deal or unrest and disillusionment and Mussolini was fully prepared to exploit the opportunities. By 1920, Mussolini and his fascists were a force to be reckoned with in the land, especially in the industrial north. Within a short period, Mussolini and his party were almost a state within a state. They were soon running a parallel administration in many towns. Mussolini's rise was aided by several factors that were exacerbated by World War I. There was no leadership at the national or state level. The Italian government was divided, as the country's democratic parties could not come together. The Italian Liberal party and the Catholic Party refused to work together, because of the issue of Church-State relations in Italy. This division meant that the country lacked a strong government in the vital period of the war and this, in turn, allowed the Fascists to become a powerful force in the land. Additionally, many people in the government, civil service, and the army were conservatives and somewhat sympathetic to the aims and the rhetoric of Mussolini. His ideology appealed to them. Mussolini's appeal and the weakness of the government meant that Mussolini was rapidly able to build up his power in the country. Mussolini and his Fascists also effectively used violence and terror to gain control The Black Shirt Squads who used violence to intimidate, torture or even kill those who opposed the will of Mussolini. They were feared by many, however, many in the confused post-war period saw them as a source of stability and security, and this won them a measure of popular support, among many in the middle class. The radical left was particularly strong in Italy during the Great War, as it benefitted from the unpopularity of the government, and the war among the poor and the working class. In 1917, the Italian Socialist Party allied itself with the Soviet Union and agitated for a revolution in Italy. Industrial workers in the major Italian cities had formed themselves into powerful trade unions. They frequently went on strike, during the difficult war years, and were often brutally repressed by the Italian police and armies. After the end of the First World War, many cities were paralyzed by these strikes and these actions greatly alarmed the middle class and wealthy Italians. From 1919, Mussolini’s Fascist Black Shirts fought with Socialists and others in the streets of Italy. The Black Shirt squads were very effective, and they managed to break many strikes and intimidated, injured and killed many socialists and trade unionists. This made them very popular among those who feared a revolution. This meant that many in the Italian middle class and elite began to see the Fascists as capable of saving Italy from a 'Red' revolution as in Russia. However, many, even some conservatives were not in favor of Mussolini and his party, but he was seen as the lesser of two evils and anything was better than Communism and Socialism for many upper-class Italians. The Fascists presented themselves as the saviors of Italy by Mussolini who was a skillful propagandist. Propaganda is a method of persuading people to do things and commit actions to further some interest group or faction. Mussolini was a pioneer in its use, and an admiring Adolf Hitler would model his public speaking on Mussolini. The leader of the Italian Fascists was a charismatic speaker, and he spoke in an emotive style that appealed to Italians, and this won him many supporters. The Fascists used a series of symbols to associate themselves with Rome and the glories of Italy's past. 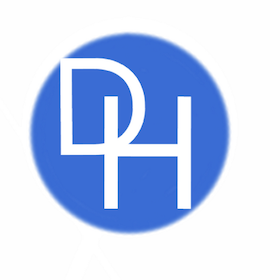 The party was named after the Roman symbol of justice - the Fascii. The use of symbols of such symbols appealed to many Italians at a time when they felt that their nation had been humiliated in the war and by the Treaty of Versailles. 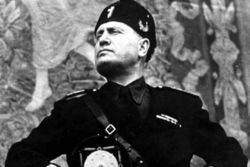 Above all, it was Mussolini's anti-communist rhetoric that won him a substantial following in Italy, among all classes. It seems that the majority of Italians, the middle class, the elite and Catholics, all feared communism, in particular, and lived in fear of a revolution. Mussolini was able to portray himself and his party as the defenders of Italy as the only one's who could save the country from the red menace. However, Mussolini though increasingly popular was unable to secure power through constitutional means. The Italian Fascist party only won 35 seats in the election of 1921, far less than the Socialists. Still, Mussolini was determined to win power for himself and his Party. The coalition government was very unpopular and during a period of instability, the Fascists descended on Rome in their thousands, to demand the resignation of the Prime Minister. Some 30,000 Blackshirts traveled from all over Italy demanding a change in the government. This became known as the ‘March on Rome’. Typical of Mussolini the event was stage managed and theatrical. The Black Shirts were well drilled and disciplined. This was a deliberate policy of demonstrating that the Fascists were a force that supported law and order and the opposite of the Communists and Socialists who were seen as dangerous and destabilizing. 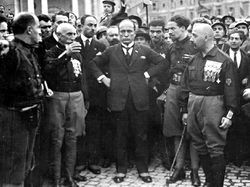 During the March on Rome, Mussolini made sure he was photographed with the marchers and made many speeches when he repeatedly stated that Itlay was in danger and that only he and his party could save the country. the March on Rome was a piece of theater designed to win him and his party the popular support they needed to seize the government of the country. The Fascists arrived in Rome and many wondered what would occur. 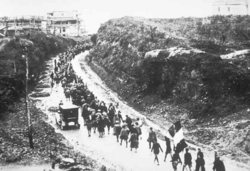 Mussolini and others feared that there would be bloodshed and that the army would fire on the marchers. The Italian Fascists would later portray their seizure of power as a ‘revolution.’ Powerful elites in Italy allowed them to take control in 1921. Italian elites wanted to ensure that Italy did not become a Socialist or Communist country. They saw the establishment of the Fascist government as the best way to avoid this fate. Without the fear of a ‘Red Revolution,’ the Italian army, monarchy, and others would never have allowed Mussolini to assume power in Rome. Mussolini and the Fascists were not the most popular group in Italy and they could never have come to power by purely democratic means. The fear of Communist Revolution meant that they were permitted to assume power and stay in power. Kallis, Aristotle. 2000. Fascist Ideology London, Routledge, 2000. Anthony James Gregor (1979). Young Mussolini and the Intellectual Origins of Fascism. University of California Press, 1979. De Grand, Alexander. The Hunchback's Tailor: Giovanni Giolitti and Liberal Italy from the Challenge of Mass Politics to the Rise of Fascism Praeger, 2001. De Grand, Alexander. Italian Fascism: Its Origins and Development. University of Nebraska Press, 2007 (3rd Edition). Farrell, Nicholas. Mussolini: A New Life. London: Phoenix Press, 2003. Bosworth, Richard J. B. Mussolini's Italy Penguin, 2007. John Whittam. Fascist Italy. Manchester University Press, 2006. ↑ John Whittam. Fascist Italy. (Manchester, England; New York, New York, USA: Manchester University Press, 2006). p. 165. ↑ Kallis, Aristotle. 2000. Fascist Ideology( London, Routledge 2000)p. 45. ↑ Gregor, 1979, p. 117.